I have been asked at Writer’s Corner to share an honest review of the application Litsy. It is a new application or app for readers. Think of this app as Instagram meets Goodreads. The app invented by Todd Lawton and Jeff Leblanc. So what was this application used for? 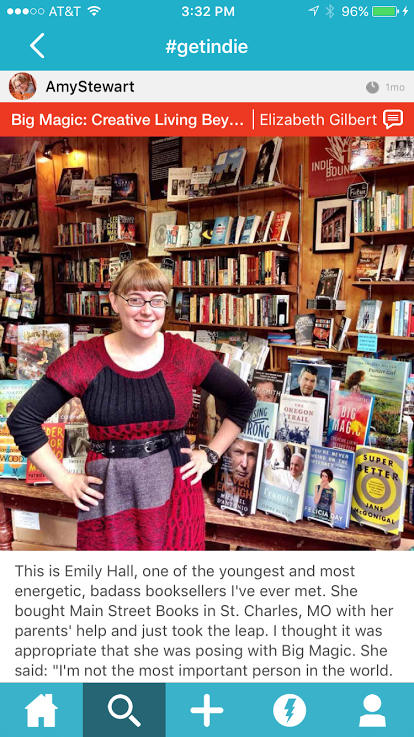 “As an independent bookstore owner, Amy is aware of how much effort goes into finding books and getting them on the shelf. During her last book tour, she used her social media platforms to discuss the books she found and the bookstores/booksellers where they can be purchased. As one of Litsy’s first subscribers, Amy quickly realized it was the perfect platform to highlight the books that independent bookstores are championing; along with the booksellers who make these discoveries and share them with their patrons. So how does Litsy work? There may not be many followers yet from your Facebook page or other social media options since it is a new app. I have a few indie bookstores that I work with on a regular basis, but have not seen them on Litsy yet. When you post on it a book has to be attached to your post. You can comment on a photo that you upload. You also have options to follow the other person or add that book to your TBR pile. If a user has problems with using Litsy shake your phone. Once this happens a prompt will ask if you have a problem. A dialogue box appears and the user can dialogue with support from Litsy. I had an issue with a Wifi problem at my work, but was able to resolve it quickly. I like the Litsy application. I feel that will develop into a user friendly application. I am interested to see what Indies do with this application and its users. As long as users are comfortable with an Instagram type application then it will seem easy to use. The only downside to me is its newness of the application. It may not work in some WIFI locations. Otherwise interesting social media tool!